A girl walks past a poster of Ayatollah Ruhollah Khomeini, at a mosque where he made speeches, in northern Tehran, Iran, Jan. 22, 2019. His image is on bank notes and in school textbooks in Iran, often as a black-and-white embodiment of the 1979 Islamic Revolution that swept aside the country's shah and forever changed the nation. 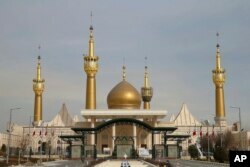 The shrine of Iran's revolutionary founder Ayatollah Khomeini is seen just outside of Tehran, Iran, Jan. 19, 2019. 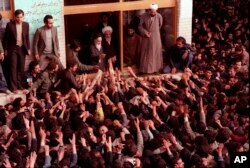 FILE - Ayatollah Ruhollah Khomeini, center, is greeted by supporters in Tehran, Iran, Feb. 2, 1979. 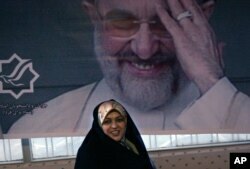 FILE - Sitting under a picture of former Iranian President Mohammad Khatami, Zahra Eshraghi, granddaughter of Ayatollah Ruhollah Khomeini, founder of Iran's 1979 Islamic revolution, looks on in the Youth office of the Coalition of Reformist Groups in Tehran, Iran, March 10, 2008. Meanwhile, one of Khomeini's great-grandchildren has grown increasingly prominent, in part due to his use of Instagram. Ahmad Khomeini, a 20-year-old Shi'ite cleric, posts images of himself in both Western attire and the black turban marking him as a direct descendent of the Prophet Muhammad. He also freely posts images of Khatami, subject of a state-ordered media blackout in Iran, and reformist politician Mir-Hossein Mousavi, who remains under house arrest years after he led Iran's Green Movement following his disputed 2009 election loss to hardline President Mahmoud Ahmadinejad. "Khomeini was great. I joined his revolution despite having a good job, a good life, simply because he said Islam is in danger," said Iraj Khalilzadeh, an 81-year-old retired worker at a shoe factory, while recently visiting Khomeini's shrine. "I expect the current government to pay attention to poor people."